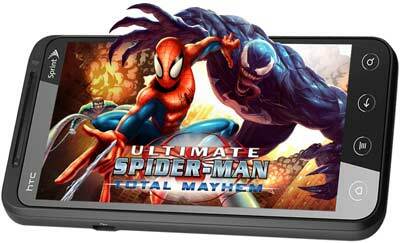 Packed full of powerful mobile communication and multimedia features, the HTC EVO 3D has a large, vibrant 4.3 inch display for easy viewing of videos--from Sprint TV programming to HD or 3D movies captured on the dual 5-megapixel auto-focus cameras. It's powered by a screaming fast 1.2 GHz Qualcomm Snapdragon processor and Google's Android 2.3 operating system. With integrated Google technology, the HTC EVO 3D brings one-touch access to the popular Google mobile services millions use every day, including Google Search by Voice, YouTube and Picasa. The HTC EVO 3D also provides easy access to both personal and corporate email, calendars, and contacts supported by Exchange Server and Gmail. And through Android Market, you'll get access to thousands of useful applications, widgets and fun games to download and install on your phone, with many more apps being added every day. The HTC EVO 3D also includes HTC Sense, a user interface overlay from HTC that makes it easy for you to create an individualized mobile experience tailored specifically to your needs. The forward-facing 1.3-megapixel camera makes it easy to have video calls using the two-way voice and video service from Qik (upgraded account service required), while the dual 5.0-megapixel cameras make it a snap to capture and record 2D and 3D images and video to share with family, friends, and colleagues. And with built-in mobile hotspot functionality, the HTC EVO 3D also allows up to eight Wi-Fi-enabled devices--including laptop, camera, music player, video player and any other Wi-Fi-enabled device--to enjoy the benefits of 4G speeds on the go. Other features include music downloads from the Amazon MP3 Store, 1 GB of internal memory with microSD memory expansion (optional 32 GB cards supported), Adobe Flash support, and HDMI audio/video output.